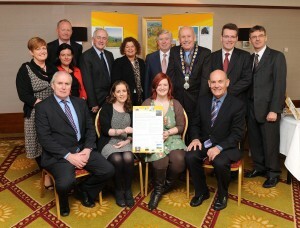 Thursday 7 April 2011 saw the celebration on the island of Ireland of the historic Memorandum of Understanding (MOU) between Newry and Mourne District Council and Louth Local Authorities. The event took place at the Ballymascanlon Hotel in County Louth. The official launch of the unique cross-border initiative took place in Brussels on 2 March 2011 and there was strong praise at that event for the work of both local authorities in putting together this strategic alliance, the first of its kind on the island of Ireland and an important model for other cross-border regions in Europe. The welcome addresses at the event in Co. Louth were given by Councillor Peter Savage (Cathaoirleach, Louth County Council) and Councillor Mick Murphy (Mayor, Newry and Mourne District Council). These were followed by presentations from Gerard McGivern (Director of District Development, Newry and Mourne District Council), who worked closely with his counterpart in Co. Louth (Michael Curran, Director of Economic Development), and Aidan Gough (Director, InterTradeIreland). Pat Cox, former President of the European Parliament, then addressed the invited guests and then called upon stakeholders in the cross-border area to sign the Charter of Commitment as a sign of cross-border cooperation in the years to come. Included in the picture above are Pat Cox, Gerard McGivern, Michael Curran, Michael McCabe (Economic Development Officer, Louth Local Authorities), Edel O’Mahony (Louth Local Authorities), Councillors Peter Savage and Mick Murphy and Dr. Pat McCloughan of PMCA Economic Consulting.